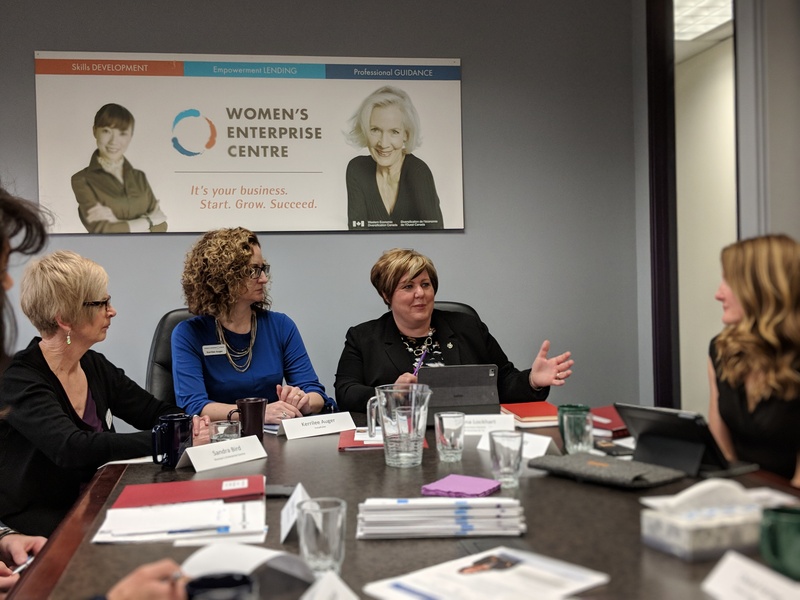 Fast on the heels of the 2018 federal ‘gender budget,’ representatives from both the Ministry of Small Business and Tourism and Industry Canada visited Women’s Enterprise Centre (WEC) BC on International Women’s Day for a roundtable to see how the budget will affect real women business owners. Our VIP guests included Alaina Lockhart, Parliamentary Secretary for Small Business & Tourism, Stephen Fuhr, MP for Kelowna-Lake Country, and Doug Kinsey, Executive Director (Pacific) at Innovation, Science and Economic Development for Industry Canada. Business owners are told to delegate to free themselves up to work on the business and not in it. But when they weigh the costs of recruiting and training a team against those of “wearing the bigger hat” themselves, the women often end up picking up the slack. The women cite the payroll tax, stringent criteria for training grants and the rise in minimum wage as key issues that affect their ability to grow their team and free up time for them to do long-term planning for the business. Business owners who are trying to grow their businesses feel the crunch even more: when they find themselves in the awkward growth stage, they can’t access grants or financing and have to let opportunities slip away. As one shared, she is currently experiencing “explosive opportunities” for her business, yet she has trouble capitalizing on them because she is busy working to access growth funding. Doug Kinsey pointed out that they government is working to streamline the application process for accessing business supports, such as the Industrial Research Assistance Program. One woman shared that she makes “a tremendous amount of risks and sacrifices” both at work and at home. As a business owner, she didn’t qualify for maternity leave benefits when she had her two children. Many women in the room echoed her sentiments at struggling to find affordable, flexible childcare that coincides with the constant demands of business ownership. This is a significant factor that can discourage women from becoming business owners. With so much focus on business growth, technology companies and innovation, often the small shops get overlooked. Yet, these businesses play an important role in their communities. Women tend to operate in the retail and services sectors. And while women are starting businesses at a greater rate than men, many are choosing not to grow their businesses. As a result, women-owned businesses are often overlooked when it comes to funding support and policy-making. Stephen Fuhr pointed out, “fair isn’t necessarily equal” and encouraged everyone to share their feedback on Budget 2018. “The name of the game is to help small businesses get going,” Fuhr said. From advocating for women business owners with policy makers, to financing businesses that otherwise couldn’t access funds, to working with women on their business plans and encouraging women to carry on when they’re doubting themselves, women’s enterprise support organizations play a very important role to help women entrepreneurs day-in and day-out. Thank you to the women who shared their different perspectives, struggles and triumphs: Ashley Ramsay of Yeti Farm Creative; Angela Nagy of GreenStep Solutions; Tracey Cochrane of PointsWest AV; Kerrilee Auger of InstaPulse; Meagan Hughes of Cottage Quilting; Camille Saltman, UBCO Entrepreneurship Director; Martine Hickman of BDC; Cheryl Farmer, Business Advisor at Women’s Enterprise Centre; and Sandra Bird, Director of Operations at Women’s Enterprise Centre, who facilitated the discussion.